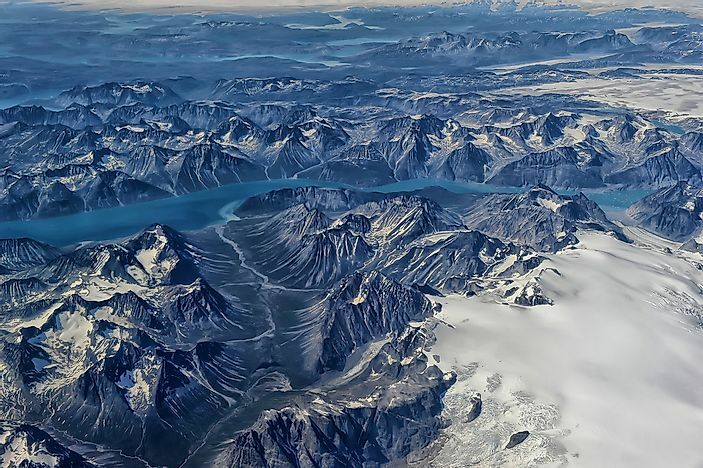 An aerial view of Greenland. Photo credit: shutterstock.com. The Greenland ice sheet is melting, and melting fast. Scientists are "very worried” that the melting of the ice sheet will raise sea levels more than expected. To add to the worries, the warmer climate is encouraging algal growth on the ice sheet, darkening the surface. The dark ice absorbs more solar radiation and warms up faster than clean white ice which implies that dark ice melts more rapidly. In the United Kingdom, a study is being conducted as a 5-year research project termed “Black and Bloom”. It aims to investigate the types, growth, and spread of algae on the Greenland ice sheet. The knowledge obtained from the study will be used to improve computer projections that are used to project sea level rise in the future. Scientists have revealed that while white snow reflects up to 90% of the solar radiation, only about 35% or even as little as 1% of the solar radiation is reflected by dark algal patches. Currently, the Greenland ice sheet is contributing to a 1mm annual rise in the global average ocean level. The ice sheet which encompasses an area the size of the UK is the northern hemisphere's largest ice mass. The ice sheet reaches up to 3km in thickness. If the entire ice sheet melts, the average global sea level would rise more than 20ft. Thus, the rate of melting of the Greenland ice sheet has direct relevance to the world’s major coastal and low-lying areas as far as Shanghai, Miami, and Bangladesh. What is even more fear inducing is the fact that rising global temperatures would trigger algal growth in the flat interior areas of the ice sheet where melting would take place at an even bigger scale. For the last 20 years, Greenland has been losing a greater volume of ice that what it has gained through winter snowfall. Thus, the natural balance that keeps the Greenland ice sheet stable appears to have changed. Scientists claim that the ice sheet might not melt completely in the next 100 or even 1,000 years. However, only a small amount of loss of ice from the sheet will be enough to threaten the lives of millions based in coastal communities around the world. The algae triggered darkening of the ice sheet acts as a catalyst in this whole process.